With as much talent as the Pittsburgh Penguins have it’s amazing to consider that some fans are still unhappy with the team. After a rough beginning to the season they rebounded in a major way with Crosby once again proving he is a force. A team that includes a roster of All-Stars apparently still warrants occasional booing, which some fans proved to be true on Wednesday against the Rangers. Let me start by saying: Phil Kessel had an off game. No one denies that and anyone watching could tell he was struggling. However, that in no way warrants booing him. I cannot imagine how it feels to be so perfect that you never have an off day at your job. Does your boss boo you? Do your friends boo you? Maybe your coworkers? No? Okay then never boo a player for one bad game. The media in Toronto was hard on Phil as were the fans. I was extremely excited when he came to Pittsburgh because I wanted him to see what a real fan base was like. A fan base that supports their players even if they have an off night. That all came crashing down last week and I am shocked. Let me repeat this: he had a BAD GAME. It’s not as if Phil somehow singlehandedly lost a game for us or that he is consistently bad. He was off. Wow, it happens. What I am asking is this. If you were one of the fans booing him, please be better. Please give these athletes the respect they deserve. Please remember he is missing his main center and as result maybe his game a little off. Please all remember that he rebounded majorly the next game. It happens, but we as fans must never become so unrealistic that we expect perfection out of our players. Enjoy the game for what it is. And enjoy the beauty of a roster that we have while appreciating that even our athletes are human. if you listened to the media and Pens fans . I heard Crosby was going to have 100 points and Kessel was to get 50 goals playing on the same line . Now reality hits . Neither will hit those lofty totals and they don't even play on the same line . 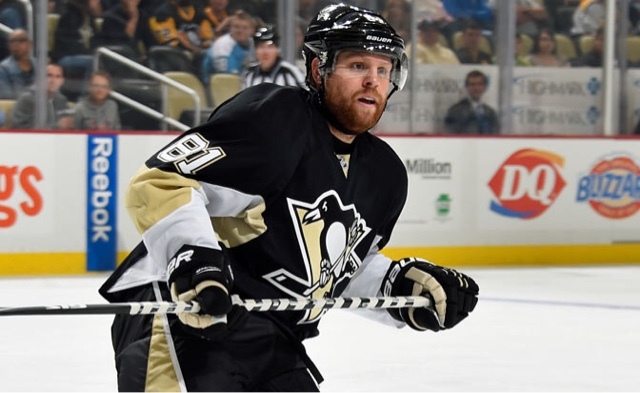 should the pens management and fans expect more for a $6 million a year player ? Yes . And if I made that kind of money a year ( and he doesn't even work 40 hours a week ) and under performed that bad , I would be not just booed , but canned . Pens fans need to learn hockey . Stop being Puck Bunnies . Just because you think a guy is " cute " you want to come to his rescue . The only players that have matched their hype this season has been Fleury , Malkin , and Hagelin .Everyone else has been lazy , childish , and inconsistent ( And I said Childish meaning Crosby with the Johnston coaching scenario in mind ) .